Priming & Top Coating | American Stripping Co. Inc.
After stripping and epoxy priming. After the paint and rust has been removed from your project American Stripping Company can apply a two part epoxy primer sealer to deactivate the bare metal surface from rusting. The epoxy coating dries closed pored which keeps air and moisture from reaching the metal. Body fillers can be applied directly over the epoxy coating after a minimal amount of scuffing. We feel this two part epoxy is the very best “first line of defense” product we can offer you to deactivate the bare metal surfaces from rusting after the blast cleaning process is complete. An acid etch primer is also available upon request. 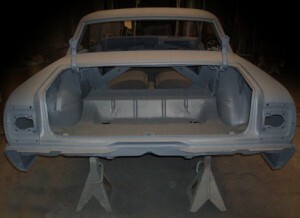 Automotive top coating available for frames, chassis’s, trailers etc. American Stripping Company offers a wide selection of priming and top coating options for your industrial needs, with an emphases on specialty coatings such as epoxies, epoxy mastics, coal tar, zinc, submersible, and high build coatings. Send us your specs for us to quote. We deliver quality work at affordable prices.